Eco Investor is ceasing coverage of Green Rock Energy as the company has targeted oil for near term production and cash flow. In early April Green Rock Energy entered an option to acquire up to 20 per cent of the Backreef Area in WAs Canning Basin from Oil Basins Ltd.
A pre-revenue micro cap company, Green Rock Energy began as a geothermal energy explorer and recently moved into gas exploration. With this latest move it has committed to oil production and says its strategy is to diversify by acquiring complementary oil and gas assets. The move into oil earns a low rating on commitment to being environmentally positive. The company appears to be spending more time and effort on its gas and now oil projects than on its geothermal projects. The Australian Competition and Consumer Commission (ACCC) has released a 40 page Statement of Issues on APA Group's proposed acquisition of Hastings Diversified Utilities Fund, and invited public submissions by 13 April. The ACCC's final decision will be deferred until 26 April. The ACCC seeks comment on competition issues and the likely developments impacting on the demand for, and supply of, gas and how these developments may affect the demand for pipeline capacity, flows on pipelines and competitive constraints on the merged firm. DUET Group subsidiary United Energy (UE) has priced $200 million of five-year medium term notes at a fixed coupon of 6.25 per cent per annum. The proceeds will be applied to both refinance UEs $150 million term debt facility, which is drawn to $100 million and matures in December 2013, and for general purposes. Australian Foundation Investment Company has become a substantial shareholder in Hastings Diversified Utilities Fund with a 5.07 per cent interest. The Fund will repay a $41.8 million Warrant Call Notice from the Government Investment Corporation (GIC) of Singapore. The warrants were issued as part of the debt financing provided by GIC in 2009 that enabled the completion the South West Queensland Pipeline expansion. Tassal Group has had three directors resign and has appointed a new director. The three directors were David Groves, Gary Helou and Clive Hooke. They were thanked but no further information was given by chairman Allan McCallum. The new director is Trevor Gerber, a chartered accountant who was nominated by substantial shareholder the Orbis Group. Mr Gerber becomes an independent non-executive director effective immediately. He is a director of Sydney Airport Holdings Ltd and a member of Advisory Board of St Hilliers Group. Former roles include senior executive positions with Westfield Holdings Ltd.
Richard Chandler Capital Corporation has increased its stake in Energy World Corporation from 18.27 to 19.36 per cent. The Sydney Morning Herald says there is an error in Energy World Corporations accounts. Journalist Michael West wrote E&Y had signed off on a set of company accounts as ''true and fair'', as you do, and we simply bet them $100 that these accounts were not correct. The company in question is Energy World Corporation, an aspiring producer of liquefied natural gas plants, of which we wrote last week. Alas, neither the firm nor the individual auditor to the company - who was unavailable on the telephone - was prepared to accept the bet. Out of sheer goodwill though - and knowing how fastidious the firm is about its fearless and independent audit opinion - we even narrowed the terms of the bet in our counterparty's favour. Not a whimper from the venerable giant [E&Y], he wrote. QR National is exercising its pre-emptive right to acquire additional equity in the Moorebank Industrial Property Trust (MIPT) in which Qube Logistics is also an owner. QR National will pay $41 million to take its stake to 33 per cent. Qube was to acquire Stocklands 55 per cent interest in MIPT, but with by exercising its pre-emptive right to part of this equity QR National will hold 33 per cent of MIPT and Qube the balance of 67 per cent. DoloMatrix International is to make a further capital return of 1.8 cents per share together with a further fully franked dividend of 1.8 cents per share. An initial capital return of 35 cents was paid to shareholders on 29 February. The total of the capital returns and franked dividends will be 38.6 cents. This is in line with the companys expectation in December 2011 when it announced the sale of its assets to Tox Free Solutions. Bill Moss AM will resign as a non-executive director of Energy Action on 30 June. Mr Moss has been with the company since December 2010 and was instrumental in its successful IPO. The company will search for a replacement independent non-executive director. Chief executive officer Val Duncan said that Energy Actions strong relationship with Moss Capital will not be impacted by the resignation. Meanwhile, Nathan Francis has been appointed as executive director finance and company secretary. Hydromet Corporation has won a $1.32 million grant towards the installation of its proposed small scale lead smelting furnace at the Unanderra site near Wollongong. The furnace will recover and produce lead bullion from lead oxide paste which is generated from the companys used lead acid battery (ULAB) operation and from other waste streams such as CRT glass. The company will finalize the economic and technical evaluation of the project including the likely feed streams and the products in the next few months. Subject to the above outcome the construction of the new plant could commence in early 2013. The project is expected to cost about $4.6 million. The grant is under the first round of the lllawarra Region lnnovation and lnvestment Fund (lRllF).The balance of the project cost will be funded from internal resources and a capital equipment finance arrangement. The German Government has introduced a capital subsidy for micro power and heating (mCHP) products, including Ceramic Fuel Cells products. From 1 April, subsidies are available for eligible mCHP products which generate up to 20 kilowatts of electricity and meet performance requirements including a total efficiency of at least 85 per cent. Ceramic Fuel Cells BlueGen and integrated mCHP products will receive a subsidy of 1,800 Euros per unit, which will go to the end customer who installs the product. The program is in addition to the German CHP Law, which requires that 25 per cent of Germanys electricity generation come from small and large scale combined heat and power by 2020. Meanwhile, Ceramic Fuel Cells German sales partner sanevo blue energy has received its first order for a BlueGen unit in Austria, and a follow-on order in Switzerland, which are part of sanevo blue energys first order for 100 BlueGens. About 30 of sanevo blue energys sales partners are now offering BlueGen to customers across Germany. Hydrotech International has raised $2.25 million through a combination of a placement to clients of Patersons Securities and a renounceable rights issue that will be underwritten by Patersons. Two directors - Tony McKee and Karl Grebstad, have resigned effective immediately. Mr Grebstad was a founding shareholder. The rights issue is on a 4 for 1 basis with shares to be offered at 0.1 cents each. One free listed option will be issued for every two new shares and these will be exercisable by 31 March 2015 at 0.1 cent each. The placement of 70 million shares raised $70,000, and the rights issue will raise $2.18 million. Vmoto is holding a rights issue to raise up to $3,812,032. It has also corrected several details in its recent Strategic Marketing and Operational Update. The one for two pro-rata non-renounceable rights issue is at 1.2 cents per share. Each new share will receive one free option with an exercise price of 4 cents and an expiry date of 31 December 2014. The funds will be used with existing funds towards the expansion of the companys product range, improved quality control measures, marketing and better after sales service, the companys Stage 2 manufacturing facility in Nanjing in China including purchasing electrical fixed assets, and for working capital. The rights issue is not underwritten. Vmoto has corrected several statements in its Strategic Marketing and Operational Update of 28 March. The heading Denmark TAO Newspaper Delivery should have read Denmark DAO Newspaper Delivery. The Company said 32 units of electric scooter samples have been delivered when a total of 140 units have been delivered via Vmotos distributor, EVScandia. The company stated that Denmark Post has ordered 5 units of samples to be delivered for trial. The Company is currently working with Denmark Post to prepare the electric scooters in accordance with Denmark Posts requirements. In fact, three sample units were ordered by Vmotos distributor in Denmark, EVScandia ApS, and these are being prepared for general postal and delivery use, not specifically for any postal service. WestSide Corporations Meridian SeamGas joint venture has executed an agreement with the owners of the adjacent Dawson coal mine under which the Dawson mine will gain early access to 0.8 square kilometres within a co-development area of the mining lease, while Meridian will continue to drain gas from existing wells. The early access has been granted in exchange for a commitment to compensate Meridian SeamGas for any loss of production revenue from five associated wells for a period of two years if production is adversely affected. The Meridian SeamGas projects certified gas reserves will be unaffected because the area concerned has never been included for reserves assessment. Galaxy Resources and Canadian lithium and potash exploration and development company Lithium One Inc are planning to merge and form the largest lithium pure play company in the world. Lithium One owns the prospective Sal de Vida lithium and potash brine project in Argentina, for which a preliminary economic assessment in October 2011 estimated a net present value of US$1.07 billion, and the James Bay lithium pegmatite project in Quebec in which Galaxy has a current 20 per cent stake under a farm-in arrangement. Galaxy managing director, Iggy Tan, said the merger is an excellent opportunity for Galaxy to boost its global lithium resource base and become a major global lithium company. Galaxy will require more lithium resources over the next few years, and Sal de Vida along with James Bay will significantly add to our existing Australian resource inventory and gives us ample resources to continue to grow the lithium business and drive the long term value of the company. The merger is not only a good strategic fit for Galaxy, it also represents an opportunity for Lithium One shareholders to become part of a lithium producing company with hard rock and brine assets around the world. Under the agreement, Galaxy will acquire all of the securities of Lithium One via a Plan of Arrangement that will give Lithium One shareholders not less than 1.8 shares for each Lithium One common share. As a pre-cursor to the transaction, Galaxy will undertake an equity raising of $50 million to strengthen the merged entitys balance sheet and increase its finances. The funds will be used for working capital for the Mt Cattlin and Jiangsu projects, to accelerate development of Sal de Vida; debt servicing, capital raising fees and merger costs. The equity raising, expected to be completed before the merger, is through an equity placement and share purchase plan. If all goes to plan, the merged entity will have a market capitalization of just under $0.5 billion. Algae.Tecs Shoalhaven One showcase algae-to-biofuel facility has completed the cement platform structure and associated plumbing ready for the containerized bioreactor technology. Commissioning is expected in late April rather than the end of March due to heavy rains in the Nowra region south of Sydney. Technical director Earl McConchie will arrive from the US to oversee the final phase of the project. Project planning for the algae to biofuel facility at the Holcim cement plant in Sri Lanka is complete. The bioreactors are being fitted out at Algae.Tecs Algae Development & Manufacturing Centre in Atlanta, Georgia, which has been expanded to accommodate the commercial production programs. The despatch of the bioreactors to Sri Lanka will commence by late May. Executive chairman Roger Stroud said both facilities offer carbon capture. 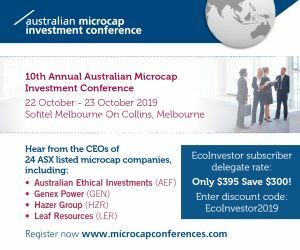 In Nowra the Algae.Tec facility will take a carbon feed from the Manildra Group operations, and in Sri Lanka the facility will take a feed from the subsidiary of industrial giant Holcim, the world's largest cement and building materials company, he said. Chairman Richard Caldwell has indirectly acquired 500,000 shares on market at 19 cents each. Mr Caldwell also indirectly acquired 80,000 shares at 18 cents each in the recent share purchase plan. Enerji has raised $28,575 through the issue of 2,597,765 shares at 1.1 cent each to a private investor. It also issued 30 million listed options with an exercise price of 3 cents and expiring on 30 June 2015. The issue was for the provision of corporate services. Enerji has installed the second of the three heat recovery units (HRU) at the Carnarvon project in Western Australia. Recent clear conditions at Carnarvon have allowed the installation of the first two HRUs following a delay caused by inclement weather. Installation of the third and final HRU is imminent, with commissioning expected at the end of April. The HRUs incorporate an Airec heat exchanger to capture the heat from the engines hot exhaust. The design of the waste heat to power system (WHPS) means that the exhaust is diverted through the Airec heat exchanger and then channeled back to the original exhaust stack. K2 Energy is commencing negotiations with Mears Technologies Inc about a possible merger of the two companies. Mears has begun exploring opportunities to list on the ASX and, as K2 holds 8 per cent of Mears and 15 per cent on a fully diluted basis, a merger and backdoor listing via K2 could benefit both companies. The intention is that the merged entity would retain K2s listing but under the name Mears Technologies. Mears is commercializing 10 years of research and development that can be used by semiconductor chip producers for the solar PV sector. The MST. CMOS technology can reduce gate leakage and increase drive current to improve power and performance in CMOS semiconductors. Testing of the new design is about to commence at the CNS facility at Harvard and results should be ready by mid-May. The Mears board recently implemented changes to the company to assist with commercialization. These include a new management team, a new business plan, a new multi-track commercialization program, and a reduction in the burn rate. The revised commercialization strategy involves a more aggressive, multi-track approach, with broader engagement in the industry to cross-pollinate the various tracks, raise MSTs profile, and promote MST demand in the marketplace. Mears is in the process of raising US$2 million to fund the company through its next stage. K2 has agreed to commit US$1 million to the raising, subject to certain conditions including the commencement of negotiations on a possible merger of K2 and Mears. Kimberley Rare Earths has begun the first systematic exploration program of its 40 per cent owned Malilongue Heavy Rare Earth Project in Mozambique. KRE entered into the Malilongue Project in September 2011 to take advantage of the joint ventures strong prospectivity for xenotime-hosted heavy rare earth oxides such as yttrium, dysprosium and erbium, coupled with the strong market outlook for heavy rare earth products. A program of high-impact exploration is underway to rapidly assess priority heavy rare earth targets identified from regional geophysical data sets previously advised to the ASX on 17 February 2012, it said. Shares in Lithex Resources fell to 8 cents on 3 April ,their low lowest level since the companys IPO. On the same day the company provided an update on its Shaw River Project near Marble Bar in WA, saying it has commissioned HyVista Corporation to conduct an Airborne Hyperspectral survey across the entire Shaw River group of tenements, an area totaling 418 square kilometres. The aim of the survey is to identify pegmatite rocks as pegmatites in the Shaw River area are known to host heavy rare earth, tin, tantalum and lithium mineralization.